When it first tipped up three years ago, LED backlighting was the must have technology for folk using their PCs and monitors for anything that needed accurate colour reproduction. As with any new tech though it came with the expected price premium and it's taken a while for it to trickle down to a price that us normal folk can afford. 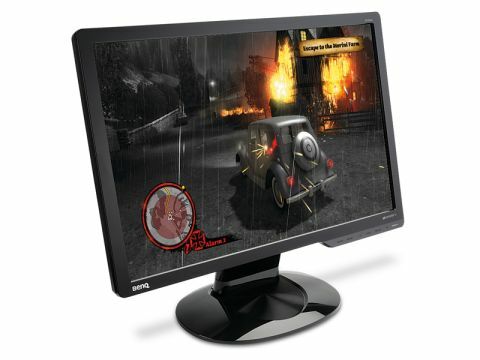 Now though BenQ has released a wee fella called the G920WL for under a ton that can do the job for you. At less that £100 it's what you'd normally expect to pay for a diminutive 19" monitor, but with the LED backlighting tech in tow that's a nice added extra to have on your specs sheet. With this pricing even if you're just an amateur photographer or designer you've now got the chance to cadge a display that you can trust to give you a proper representation of your chosen images. It's a sharp, clear panel, with a thoroughly impressive viewing angle and great black representation. If you're into your poorly-lit, survival horror then this is a great display for you, allowing you to see far more detail in the dark than a standard LCD. The limited 1440x900 native resolution which can feel cramped on-screen, especially if you want to work with multiple windows open at once - but at this price you can afford to think of it as a second monitor that you use for image manipulation or the darkest gaming. The G920WL then is a bargain backlit beauty, perfect for the amateur photographer/designer and one who's also a closet gamer.